With their early days seeing them sail through the recession and the birth of commercial music streaming, it’s amazing that First Word Records – and many other UK labels birthed in the 2000s for that matter – is standing strong today. Deservingly awarded with Label of the Year 2019 at Gilles Peterson’s Worldwide Awards, it’s a great time for the First Word Family to reflect. The London imprint is 15 years old this year, and they’re marking their birthday with events and album releases from some of the most celebrated artists on the label. Watch out for their compilation highlighting their favourite European musicians and producers, dropping on 29 March – Brexit Day. First Word Records have developed a recognisable signature sound, championing producers, beat-makers and musicians alike. At first glance, the label ignite innovative hip-hop, but with further examination, you can see that many of the releases lead back towards an appreciation for Jazz and soul. To mark their fifteenth anniversary, we talk to label founder – and European label rep for Bandcamp – Aly Gillani. \\ Congrats on the Worldwide Awards win earlier this year! Did you have any idea when you arrived that night that you were taking the award home? Thank you! The team behind the awards had dropped a few hints – I was meant to be in the US for Bandcamp on the night of the awards, and although I never 100% knew why, it was suggested that I should definitely be at Koko for the event. I had to change some flights around, but it was worth it in the end. I’ve grown up listening to Gilles’ show; I remember clearly going to an event he put on in Leeds in 2003, broadcast live on BBC Radio One which was a huge inspiration to us when we started out – I’ve still got a CDR copy of it somewhere. So to be recognised at the Worldwide Awards is hugely gratifying – I’m still smiling! \\ How do you approach the art of taking creative risks? Interesting question! I think we spent a long time finding our identity as a label, trying lots of different things to make a breakthrough. I think the risk for us – which actually turned out to be the most sensible decision we’ve ever made – was to spend a year or two focussing the label’s sound. By having a strong core sound, it gives us the ability to experiment and take risks. So if music heads know that there are releases around the corner from Children Of Zeus, Kaidi Tatham, Eric Lau and Darkhouse Family, it means they are willing to take a chance on us when we introduce something new like Quiet Dawn or 14KT. So we’ve earned the right to take risks by making sure we’re trusted by fans of good music. \\ Whats been the label’s proudest moment to date? I think our first radio play back in 2004/5 was pretty memorable. Trevor Nelson played a track by a group called Today’s Mathematics on BBC Radio One and that was definitely a big moment. The release went on to sell only 30 copies (out of 500) so it turned out to be a slightly false dawn, but that’s how it goes I guess! More recently, working with Children of Zeus since their first release has been really rewarding – seeing them play at the opening concert for Outlook Festival this year in a 2000 year old Roman Amphitheatre was a realisation of years of work from Konny and Tyler. It’s been amazing for us to tag along for the ride. \\ What do you know now that you wish you knew when you started First Word Records? Oh, so much! We knew almost nothing when we started, although people like Rob Luis at Tru Thoughts were very generous with their time and advice which was a big help. I’m not really big on looking back on how we could have done things better – I’m happy where we’re at now, and everything we’ve done – good and bad – is part of that journey to this point. Getting things wrong is sometimes the only way you can learn – and that happens to this day. The minute you think you’ve got nothing else to learn is possibly when it’s time to call it a day and move on to something else! \\ We have to mention that you’re the European label rep for Bandcamp. How does it support you on the A&R side of things? Interestingly I think it helps me more on the label management side of things – even though that is handled by Bobby, Delia, Neil and the rest of the crew here on a day-to-day level. A big part of my job involves meeting with record labels of all shapes and sizes. Seeing how they run their businesses is a massive learning experience. There are hundreds of different approaches out there, and I try and take little ideas from everywhere I can to improve how we operate. Also working for a company like Bandcamp is inspiring – the leadership that they take on things like the ACLU, TLC and Voting Rights pledge days really helps to put it all into perspective. \\ What’s coming up in your fifteenth year? Lots of exciting music! 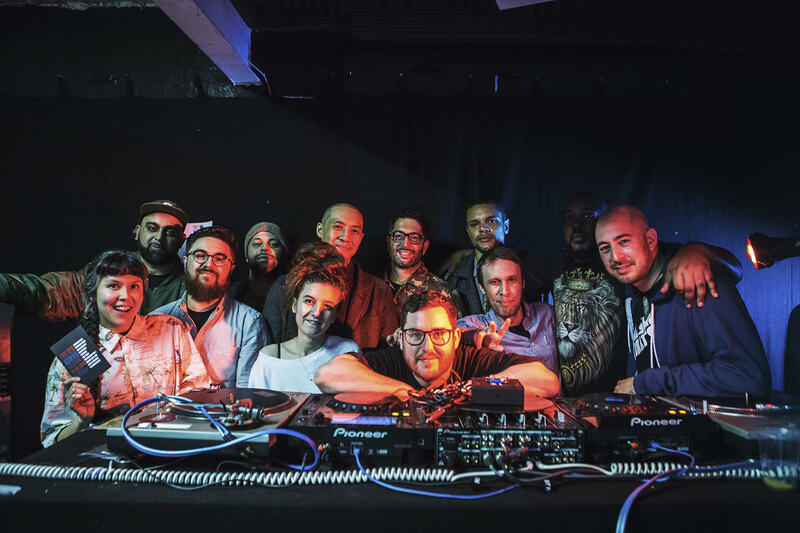 In the next month or so we’ve got a beat-tape from Souleance – who’ve been with us for 10 years now – and a jazz/hip-hop album from 14KT in LA that features James Poyser, Stro Elliot, Masego and more. After that there’s new music from Don Leisure, Darkhouse Family, Kaidi Tatham, Children Of Zeus, Ross McHenry and Myele Manzanza, plus the return of Teotima Ensemble who released their debut album with us back in 2013. We’re also releasing a compilation album on March 29th – Brexit Day; we’ve put a call out for producers and musicians from as many different European countries as possible to submit music for inclusion. We wanted to restate our feeling that borders and divisions won’t stop us seeking to create musical communities across the world – I’m really excited to hear what people send in. We’re also hoping to put together some special events to celebrate fifteen years of First Word, so keep an eye out for that.